So simple and so versatile. Offer these light and tasty little bites to your guests as an appetizers or let them play a supporting role on top of your favorite salad. 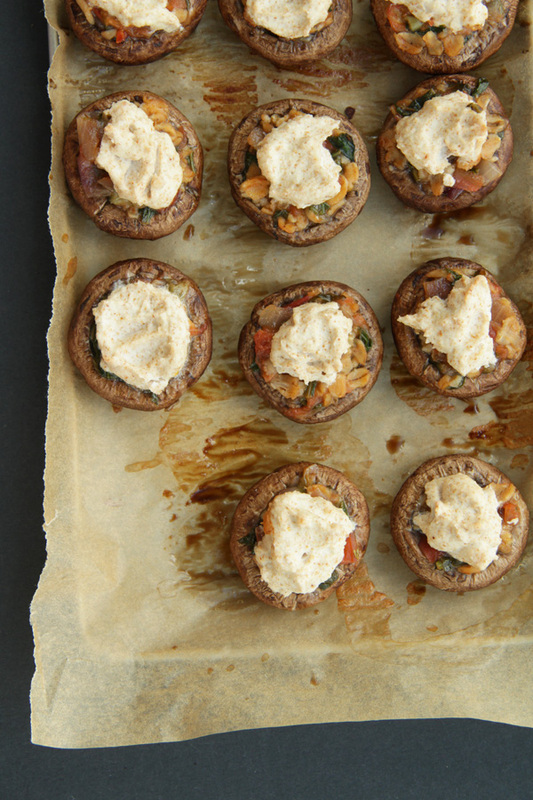 You can use either cremini or regular button mushrooms. Look for those that are firm and evenly colored, avoiding any that are broken, bruised have soft spots or seem slimy. Make sure they smell woodsy, not moldy. We recommend you buy your mushrooms on the day you plan to cook them, although they’ll keep for up to three days in the refrigerator. They tend to sweat if stored in plastic, so always opt for a paper bag instead. Mushrooms themselves provide you with lean proteins since they have no cholesterol or fat and are very low carbohydrates. They make an ideal low-energy diet for diabetics. Mushrooms are also a good source of iron, and over 90% of the nutritive iron value can be absorbed by the body, which promotes the formation of red blood cells and keeps people healthy and functioning at their full potential. On top of that mushrooms are a rich source of calcium, which is an essential nutrient in the formation and strength of bones. 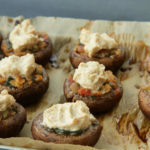 These vegan stuffed mushrooms make a great starter or party snack, but they can also be paired with a big green salad for a filling plant based meal. A mix of veggies, oats and herbs make up the flavorful stuffing. Top it off with some vegan feta and you got one delicious meal! Gently wash and remove stems from mushrooms. Carefully carve out a portion of the inside of the mushroom just enough to make room for stuffing. 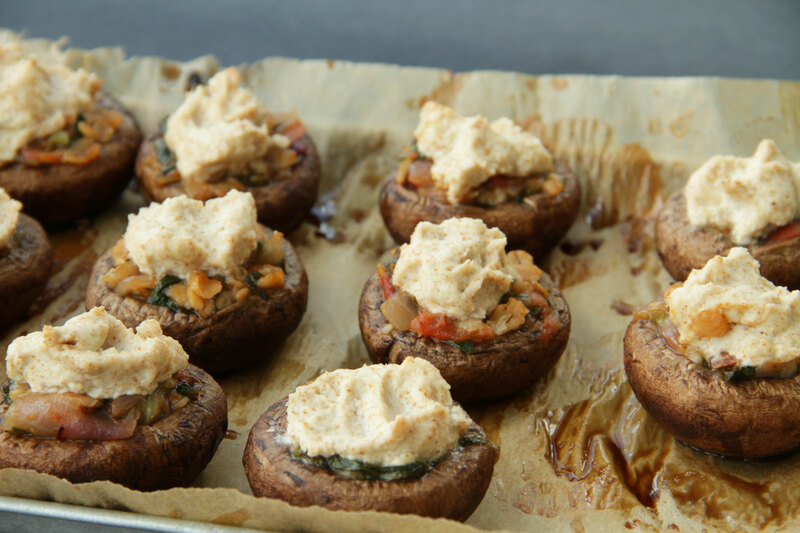 Put mushrooms, smooth side on top, on a prepared baking sheet. Cook in a preheated oven for 5 minutes. In a small skillet, warm coconut oil and saute onions for 3 min adding touch of water if necessary. Add garlic, salt and pepper and continue to cook for 2 more minutes. Add tomatoes, spinach, oats and water to the onion mixture, mix well and cook for 5 minutes. Finally mix in oregano and coconut amigos, turn the heat off. Spoon 2 tablespoons of filling into each mushroom cap, packing it in as tight as possible. 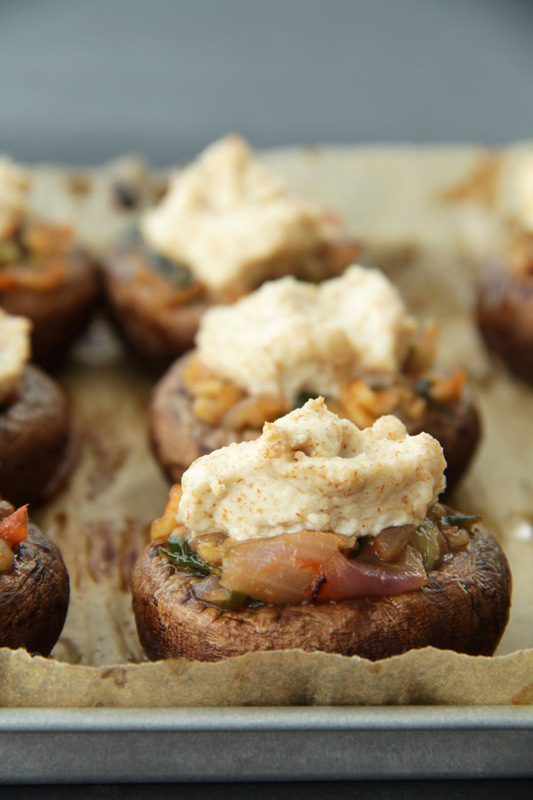 Bake for 10 minutes, until mushroom is tender to tops of filling are lightly browned.